Prior to the wide adoption of electric refrigerators during the 1920s, households maintained their perishable products using ice boxes. Generally, block ice was delivered to homes within town limits, while farms in the outlaying areas often maintained a separate outbuilding often referred to as an ice cellar. an early model General Electric "monitor top" electric refrigerator. This particular GE refrigerator model was introduced in 1927. Source: Collection of Steven R. Shook. The history of the ice industry in Porter County is a quite fragmented. In 1841, a grist mill was erected south of Valparaiso along Salt Creek by William Cheney. 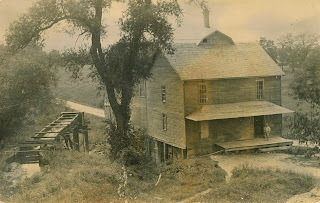 Cheney placed his grist mill at the former site of a sawmill owned and operated by Samuel Shigley. Shigley had constructed his sawmill around 1836. Samuel Shigley was born on August 25, 1803, in Ohio. He was a pioneer of Tippecanoe County, Indiana, emigrating from Greene County, Ohio, and establishing a successful farming operation in northern Tippecanoe County. Research suggests that Shigley never resided in Porter County. Rather, he established a sawmill along Salt Creek to manufacture lumber for the new village of Valparaiso as a speculative investment. Shigley would die on May 28, 1877, leaving an estate of more than $30,000 (nearly $670,000 in 2017 dollars). Cheney sold the mill to Morgan B. Crosby, and Crosby sold the operation to William H. Sager and John N. Skinner in 1854. Crosby was an early pioneer of Porter County, arriving in 1839. He was born on November 17, 1809, in Putnam County, New York. He passed away on March 5, 1895, at Valparaiso. Though his funeral took place at the home of his son-in-law, Samuel S. Skinner, in Valparaiso, Crosby's burial location is unknown. The most likely location of Crosby's interment is Maplewood Cemetery in Valparaiso. William H. Sager was born on January 6, 1827, in Hardy County, Virginia, and moved to Valparaiso on May 5, 1854, from Cass County, Indiana. He married Mary E. Gifford in Valparaiso on December 28, 1857; this union resulted in ten children. William died on May 6, 1884, at Valparaiso. His funeral took place from his home on May 8 and he was buried at Graceland Memorial Park in Valparaiso. Sager's business partner, John N. Skinner, was born February 5, 1822, in Wayne County, New York. Skinner arrived in Porter County in 1840 and rented a small farm. He then read law under Harlow South Orton at Valparaiso. In 1851, John married Joanna E. Marshall and together they were the parents of eleven children. Skinner was elected mayor of Valparaiso in 1872 and was still the mayor when he died on April 28, 1882, at Valparaiso. Skinner was buried April 29 at Union Street Cemetery in Valparaiso. Orton, incidentally, would leave Valparaiso in 1847 for Wisconsin, eventually becoming dean of the University of Wisconsin Law School and, later, the chief justice of the Wisconsin Supreme Court. The exact year that ice was first being commercially removed from Sager's Lake is lost to history, but it is believed that it was quite early in Porter County's history. Though William Sager owned the grist mill and adjacent reservoir (Sager's Lake), it was his son Chauncey A. Sager that was heavily involved in the ice industry in Porter County. Chauncey Sager was born prior to the Civil War, probably in 1860. He married Rosa Belle Ferguson of Bloomington, McLean County, Illinois. Rosa passed await at Valparaiso on July 27, 1890, and was buried at Evergreen Memorial Cemetery in Bloomington. Chauncey died on February 8, 1941, at Porter Memorial Hospital in Valparaiso as a result of coronary embolism and was interred at Graceland Memorial Park in Valparaiso. Chauncey Sager also found a bit of fame in developing technology to automate ice cutting and to cut blocks to a standardized size. 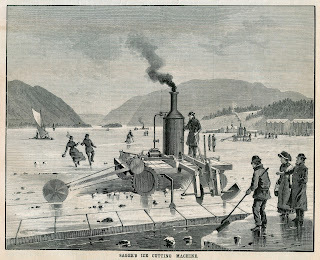 In 1882, Chauncey received patents in the United States and Canada for a steam powered ice cutting machine. 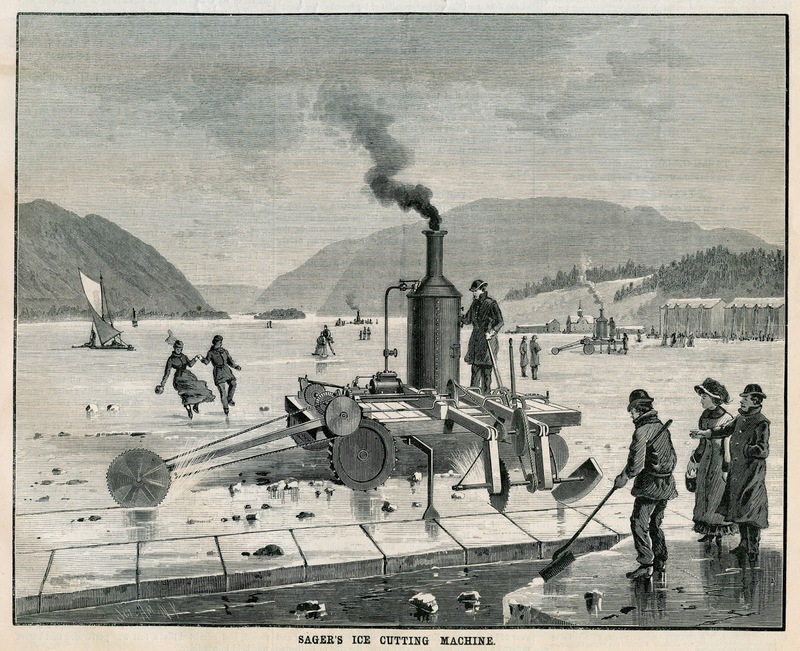 Sager's ice cutting machine seems to have generated substantial interest, as Scientific American published an engraving of Sager's invention on the cover of its July 22, 1882, issue (see engraving below). The lake shown in the Scientific American engraving is obviously not Sager's Lake. Canadian Patent No. 15514 granted to Chauncey A.
Sager for improvement to ice cutting machines. Engraving showing two Sager Ice Cutting Machines. Source: Scientific American, July 22, 1882 [front page]. Postcard image of Crosby's Mill at Sager's Lake, circa 1908. The 1893 Valparaiso City Directory lists Edward Hobart Earle as an ice merchant. Earl resided at 30 North Morgan Avenue. Research concerning Earl, however, proved fruitless with regard to yielding information concerning his ice business. Edward was born on May 25, 1861, in Pennsylvania, and married Effie S. Rowe. He died on September 12, 1894, at Valparaiso, as a result of consumption (tuberculosis) and was buried at Maplewood Cemetery in Valparaiso. 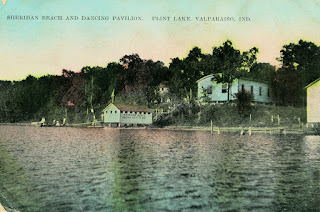 The Hobart Ice House operated at Sager's Lake during the early 1900s. It is possible that the Hobart Ice House leased Sager's facilities, later shipping warehoused ice to Lake County. 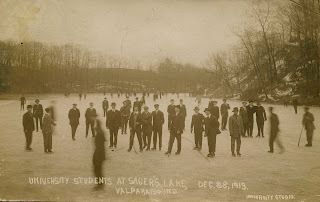 The Consumers Company of Chicago operated an ice business at Sager's Lake as early as February 1914, probably purchasing the Sager's business. The Consumers Company stored their ice at an ice house located along the shore of Sager's Lake; this ice house could inventory approximately five thousand tons of ice. The company would also ship ice to its Valparaiso storage facility by rail from Wisconsin. tiered conveyors under the main sloped conveyor. 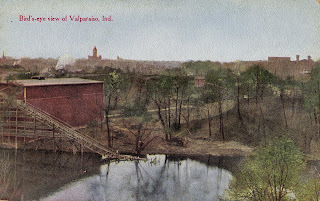 In July 1919, members of the Valparaiso Chamber of Commerce met to discuss the construction of an ice house in Valparaiso. There was also discussion about building an artificial ice plant that would supply the ice house. The high price of ice and the poor service associated with its delivery from the Consumers Company were the motivations for the meeting. 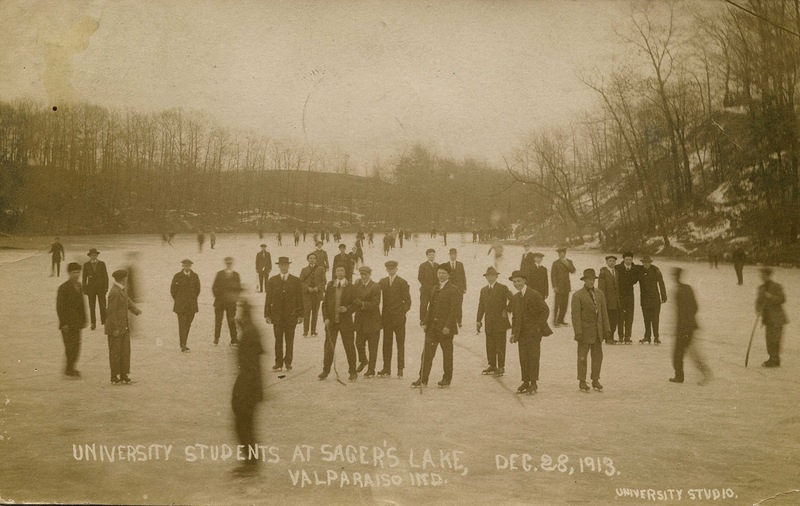 Perhaps the Valparaiso Chamber of Commerce meeting provided the incentive for the Valparaiso Spring Water Ice Company to purchase the Consumers Company's Valparaiso ice operations on Sager's Lake in 1919. 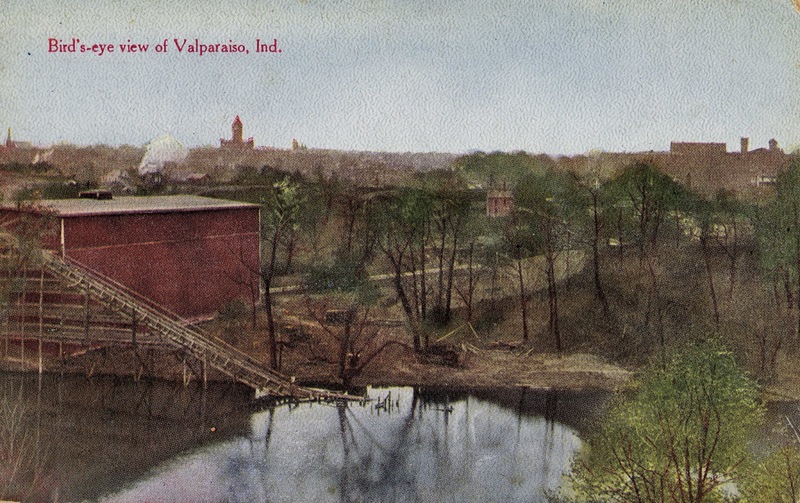 The Valparaiso Spring Water Ice Company was operating as early as 1905, the business being listed in Bumstead's Valparaiso City and Porter County Business Directory that year. Unfortunately, little information can be found about the Valparaiso Spring Water Ice Company prior to 1919. In March 1921, the Valparaiso Spring Water Ice Company purchased an artificial ice making plant and installed it in their ice house at Sager's Lake. Considerable improvements in artificial ice production soon led to a rapid decline in the production of traditional lake and river ice, as did the increasing adoption of electric refrigerators after World War I. Note that the first electric household refrigerators were introduced in the United States in 1913. Early models were expensive and not particularly reliable, which made their adoption somewhat slow. As a result, home delivery of ice in Porter County continued through the 1930s. The Grand Trunk Railway maintained a large ice house in Valparaiso. One report from 1908 indicates that sixteen railcars of ice were required to fill the railway's Valparaiso ice house. In 1920, the Foster Lumber and Coal Company of Chicago constructed a newer ice house for the Grand Trunk Railway at the east end of their Valparaiso rail yard. The railroad used the ice for their Pullman car service. George Glissman provided ice to households in the Kouts area. Glissman was born in April 26, 1840, in Schleswig-Holstein, Germany. He emigrated to the United States with his sisters Anna and Dora 1861 and would shortly thereafter arrive in Porter County. George would marry Anna Hurst and settle on a farm north of Kouts. George married Elizabeth Tuet in 1875 after the death of his first wife. George and Elizabeth Glissman would establish The Central House hotel in Kouts, located where the community water tower is now situated. The Central House was later referred to as The Hunters Home. Given the name change, it is likely that George and Elizabeth catered to individuals hunting along the Kankakee River. It is known that George Glissman harvested and hauled ice from the Kankakee River to Kouts; the ice was harvested for his personal use, his hotel, and for sale to others in the Kouts area. Glissman died February 29, 1914, and was buried in Kouts' Graceland Cemetery. Calvin Lafayette Skinkle maintained an ice house during the 1920s at Lake Eliza in Porter Township. Skinkle owned 270 feet of lake frontage on the west side of the lake. Calvin was born April 27, 1862, in Lake County, Indiana, the son of Peter and Sarah Skinkle. In 1930, it was announced that Skinkle was planning to construct a resort on his Lake Eliza property. Two months later, however, Skinkle committed suicide on the lake's beach during the morning of October 17, 1930. Skinkle had recently been diagnosed with cancer of the stomach; despondency over his health is believed to have led to his death. Aaron Wesley "A. W." Lytle began his ice business in 1868 and retired in March 1903, leasing his ice house and wagons to a George W. Norman of the Springwater Ice Company. However, Lytle must have reentered the business since he constructed an ice house at Sheridan Beach on Flint Lake with a capacity of 3,000 tons in October 1915. Lytle constructed the ice house to compete directly with the Consumers Company in Valparaiso, which had been experiencing numerous consumer complaints due to perceived high prices. Lytle was born in Porter County at Hebron on July 12, 1841. He married Cordelia Eliza Dennison. A. W. died on March 3, 1920 in Porter County and was buried in Maplewood Cemetery in Valparaiso. 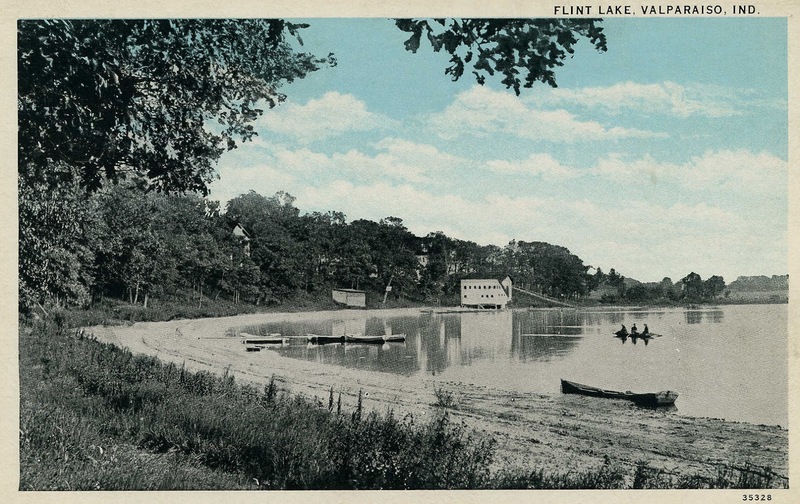 William A. Fraser would later purchase the Lytle ice house on Flint Lake, which was adjacent to the Blackhawk Beach Summer Resort owned by the Kilmer-Fraser Company. Fraser was born August 29, 1890, in Galesburg, Knox County, Illinois, and moved to Porter County from Chicago in 1925. Blackhawk Beach Summer Resort was formerly known as Sheridan Beach. 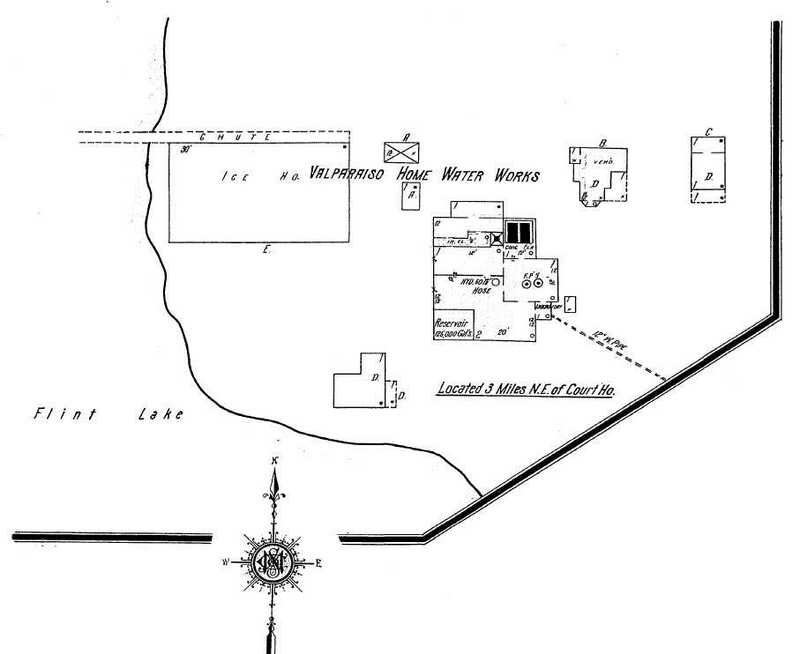 Fraser's ice house operated similarly as as the Sager's Lake ice house. Fraser was also the owner of the Flint Lake Water Company, which provided water services to the Blackhawk Beach, Burlington Beach, Edgewater Beach, and Hillcrest resorts encircling Flint Lake. Fraser died on January 25, 1959, and was buried at Graceland Cemetery in Valparaiso. building visible to the extreme far right on this postcard. Flint Lake. Note the conveyor extending out toward the shore. 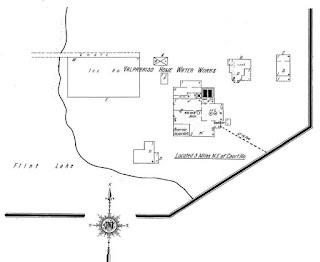 of Flint Lake showing the location of the ice house. County, Indiana, June 1926 (p. 10). In the fall of 1906 the officials of the Knickerbocker Ice Company came to the conclusion that oil existed in the sandy districts in the northern part of the county. They secured oil leases on lands from Dune Park eastward along the Calumet river and the Lake Shore & Michigan Southern railroad and began boring for oil, but soon decided that they were engaged in a futile endeavor and ceased work. Several of these Knickerbocker Ice Company's parcels were then used for sand mining, the sand being shipped to Chicago for the purposes of construction. In December 1900, Henry Goetens and E. E. McKivenew leased the right to harvest ice from the Brown Mill pond in northeast Liberty Township and Billington Lake to supply the Chesterton and Porter ice market. At this time, William L. Maxwell was supplying this local market. Goetens and McKivenew lease rights were intended to cut Maxwell from the local market by limiting his ability to source ice locally - thereby increasing his variable costs of operation. 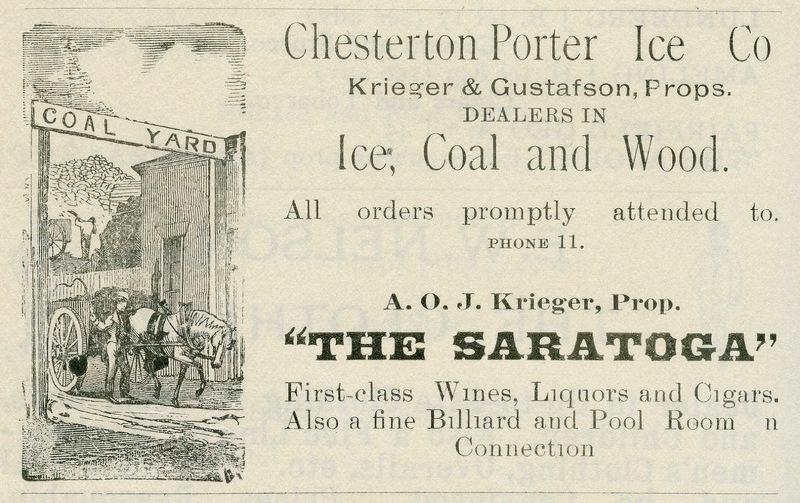 The 1905 Bumstead directory for Porter County lists Chesterton Porter Ice Company, owned and operated by Arthur Oscar John Krieger and Anton R. Gustafson. Arthur Oscar John Krieger was born March 10, 1875, in Germany. He died on March 20, 1924, in Porter County's Westchester Township and was buried in Chesterton Cemetery. Krieger would eventually discontinue his ice business and became and realtor and insurance agent. Anton R. Gustafson was born in Chesterton on February 19, 1861, the son of Adolph F. Gustafson and Clara H. (Swanson) Gustafson. On December 31, 1894, Anton married Rose Thomas. He died as a result of uremia in Westchester Township on April 26, 1929, and was buried in Chesterton Cemetery. Involved in the Porter County Republican Party, Gustafson would serve as a trustee of Westchester Township and later as postmaster of Chesterton from 1921 till his death in 1929. 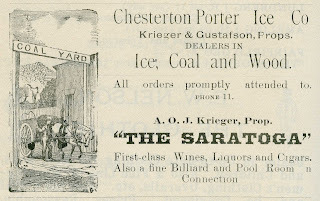 Advertisement for the Chesterton Porter Ice Company, 1905. An example of how ice would have been harvested from Sager's Lake can be viewed by watching video taken at the Tobyhanna, Pennsylvania, Ice Harvest Festival in 2010.
skating on Sager's Lake, December 28, 1913. Bumstead & Company. 1905. Valparaiso City and Porter County Business Directory. Chicago, Illinois: Radtke Brothers. 421 p.
Crew, Levick & Co. v. Chauncey A. Sager, 30 Ind. App. 252. Kraft & Radcliffe. 1893. Valparaiso City Directory 1893. Chicago, Illinois: Kraft & Radcliffe. Anonymous. 1881. Recent American and Foreign Patents. The Scientific Review and Scientific and Literary Review 16(12):135. Anonymous. 1882. New Ice Cutting Machine. Scientific American 47(4):1. Anonymous. 1882. New Ice Cutting Machine. Scientific Canadian 10(7):214, 220. Anonymous. 1882. No. 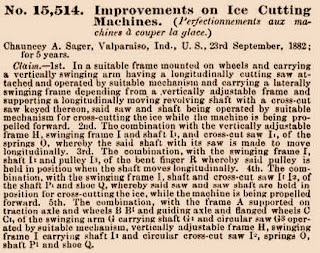 15,514 Improvement on Ice Cutting Machines. The Canadian Patent Office Record 10(9):296. Anonymous. 1902. 717,030 Grass-Edged Trimmer and Sod-Cutter. The Official Gazette of the United States Patent Office 101(13):2902. Anonymous. 1913. New Mills and Milling Companies. The American Miller 41(7):575. The Greencastle Star, Greencastle, Putnam County, Indiana; November 5, 1881; Volume 9, Number 29, Page 5, Column 5. Column titled "Indiana State News." Porter County Vidette, Valparaiso, Porter County, Indiana; May 4, 1882; Volume 26, Number 18, Page 1, Columns 3 and 4. Column titled "Death of Hon. John N. Skinner." Porter County Vidette, Valparaiso, Porter County, Indiana; May 8, 1884; Volume 28, Number 19, Page 5, Column 5. Column titled "Death of Wm. H. Sager." The Chicago Daily Tribune, Chicago, Cook County, Illinois; July 28, 1890; Volume 50, Second Edition, Page 2, Column 2. Column titled "Northwestern Items." The Tribune, Chesterton, Porter County, Indiana; September 14, 1894; Volume 11, Number 23, Page 1, Column 6. Column titled "County Seat News." The Chesterton Tribune, Chesterton, Porter County, Indiana; March 8, 1895; Volume 11, Number 48, Page 1, Column 5. Column titled "Chesterton Chips." The Chesterton Tribune, Chesterton, Porter County, Indiana; December 14, 1900; Volume 17, Number 36, Page 3, Column 3. Column titled "Chesterton Chips." The Chesterton Tribune, Chesterton, Porter County, Indiana; March 20, 1903; Volume 19, Number 50, Page 5, Column 5. Column titled "Chesterton Chips." The Muncie Morning Star, Muncie, Delaware County, Indiana; February 18, 1913; Volume 35, Number 296, Page 2, Column 2. Column titled "Evidence of Bloodhounds." The Vidette-Messenger, Valparaiso, Porter County, Indiana; August 26, 1927; Volume 1, Page 1, Columns 3. Column titled "Sager's Lake Region to be Fine Resort?" The Vidette-Messenger, Valparaiso, Porter County, Indiana; January 12, 1928; Volume 1, Page 2, Column 7. Column titled "Beatrice." The Vidette-Messenger, Valparaiso, Porter County, Indiana; August 12, 1930; Volume 4, Page 1, Columns 2-3. Column titled "Cal Skinkle to Build Fine Bathing Beach at Lake Eliza, Project to Cost $5,000." The Vidette-Messenger, Valparaiso, Porter County, Indiana; October 14, 1930; Volume 4, Page 1, Column 8 and Page 3, Column 7. Column titled "Calvin Skinkle Ends Own Life." The Vidette-Messenger, Valparaiso, Porter County, Indiana; April 23, 1934; Volume 7, Page 2, Column 2. Column titled "Back to Nature' Club is Active at Sager's Lake. "The Vidette-Messenger, Valparaiso, Porter County, Indiana; December 22, 1934; Volume 8, Page 4, Column 6. Column titled "'Looking Backward. Fifteen Years Ago." The Vidette-Messenger, Valparaiso, Porter County, Indiana; April 29, 1935; Volume 8, Page 1, Columns 6-7. Column titled "Sager's Lake, Now a Nudist Camp, is Involved in Court Action on Trespass Charge." The Vidette-Messenger, Valparaiso, Porter County, Indiana; August 18, 1936; Volume 10, Section 3, Pages 7-9. Column titled "Grade School Writes History of Center Township." The Vidette-Messenger, Valparaiso, Porter County, Indiana; February 4, 1937; Volume 10, Page 1, Columns 6-7. Column titled "Decision in Action Over Sagers Lake Title Held Up as Judge Reviews Records." The Vidette-Messenger, Valparaiso, Porter County, Indiana; May 1, 1937; Volume 10, Page 1, Column 8 and Page 2, Column 2. Column titled "Gives Nudists Lake Privacy: Court Rules Sagers Have Title to Land." The Vidette-Messenger, Valparaiso, Porter County, Indiana; February 3, 1941; Volume 14, Page 2, Column 3. Column titled "C. A. Sager in PMH Following Stroke Sunday." The Vidette-Messenger, Valparaiso, Porter County, Indiana; February 10, 1941; Volume 14, Page 1, Column 4. Column titled "Stroke Fatal to C. A. Sager at Age of 80." The Vidette-Messenger, Valparaiso, Porter County, Indiana; February 11, 1941; Volume 14, Page 2, Column 3. Column titled "Sager Rites Held Today." The Vidette-Messenger, Valparaiso, Porter County, Indiana; February 13, 1941; Volume 14, Page 4, Column 5. Column titled "Looking Backward, Do You Recall These Events?" The Vidette-Messenger, Valparaiso, Porter County, Indiana; January 9, 1945; Volume 18, Page 2, Column 1. Column titled "Local Brevities." The Vidette-Messenger, Valparaiso, Porter County, Indiana; September 29, 1957; Volume 31, Number 56, Page 3, Column 6. Column titled "Halt Asked to Boating on Sager's." The Vidette-Messenger, Valparaiso, Porter County, Indiana; January 26, 1959; Volume 32, Number 171, Page 1, Columns 7-8. Column titled "Flint Lake Developer William A. Fraser Dies." Lowell Tribune, Lowell, Lake County, Indiana; November 25, 1997; Page 16. Column titled "The Ice Industry," by Richard C. Schmal. © 2017 Steven R. Shook. All Rights Reserved. I was born in Valparaiso and raised near Chesterton, Indiana, and have had a keen interest in regional history since I was a teenager. I'm especially interested in how communities were initially established and evolved over time. The intent of this blog is to share historical information as it relates to events, people, and places in Porter County, Indiana. I currently reside with my family in Moscow, Idaho, where I am employed at the University of Idaho. Please feel free to leave comments, additional information, and corrections at the end of each blog post. If you are interested in Porter County genealogy, then you may wish to visit the Porter County Genweb site that I coordinate on behalf of the US GenWeb organization. © 2018 Steven R. Shook. All Rights Reserved. Powered by Blogger.